Benjamin Banneker (1731-1806) was an African-American scientist and astronomer who was also quite distinguished for crafting an almanac. His background as a farmer helped him create a very well received almanac when it first was published. 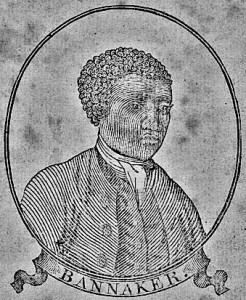 Benjamin Banneker was born in Baltimore, MD, in 1731. He was the son of a free woman and a former slave father. Banneker really did not have much of a formal education. His grandmother taught him how to read and he briefly attended a Quaker school. Banneker was mainly self-taught and his personal motivations for learning helped him develop a high level of skill in math and the sciences. Banneker’s primary profession was farming and he owned his own farm. An interest in astronomy developed through gazing at the sun, the moon, and the stars while he would work on his farm all day and into the night. He did more than just stargaze when he looked at the sky. Banneker would gain insights on how the celestial world worked and this would contribute to not only passing interest in astronomy, but an observed learning of it that was more than casual. He eventually learned to predict lunar and solar eclipses based on what he absorbed from his learning and mathematical equations that he formulated. Banneker also borrowed math textbooks and he would teach himself based on what he read in the books. The talents of Banneker caught the attention of the Ellicott brothers who were wealthy industrialists. They were interested in hiring Banneker to work for them. They subsidized Banneker’s education by offering to loan him math and science books. While working with Andrew Ellicott, Banneker helped plan and map out a new capital for the United States. Banneker than began working on the project that would make him famous throughout history. He started writing his almanac. The almanac included information on astronomical calculations, but it also included fiction, editorials, and various other topics. The almanac was a huge success. It remained in print from 1792 to 1797 and sold very well. One edition of the almanac included a letter from Thomas Jefferson. Jefferson had received a letter from Banneker admonishing him for his pro-slavery stance. Banneker became someone who gave a great deal of inspiration to those involved with the abolitionist movement as a result of this and other things he printed in his almanacs. The almanac was not the only published work Banneker created. He wrote and published works covering the topics of bees and locusts. The knowledge drawn from these books likely came in part from his experience as a farmer as well as personal research and study. Banneker was appointed the position of District of Columbia Commission by President Washington. After a distinguished life, he passed away in 1806.